New Ravenna Mosaics in the town of Exmore was chosen to represent the Commonwealth of Virginia on This Built America for revitalizing the ancient craft of mosaics. The channel presenting the story notes, “New Ravenna is making high end mosaic tile in the most unexpected place — the economically depressed eastern shore of Virginia.” AOL calls the effort a multi-platform content series featuring videos, articles, photo essays, interactive maps & more that showcase the rejuvenation of manufacturing in America. Throughout the series, a different company from each of the 50 states will be featured weekly over the next year. Content from This Built America will live across many of AOL’s family of media brands including AOL.com, Huffington Post, Autoblog, Engadget, Daily Finance, AOL Jobs and others. Videos from the series will be syndicated across the Internet via AOL’s partner network. AdAge covered the launch of the series highlighting the custom pre-roll ads that each video in the series will include. There is a video that features AOL’s Global Head of Media Sales, Jim Norton, who outlines the series and what a program like this means for AOL. 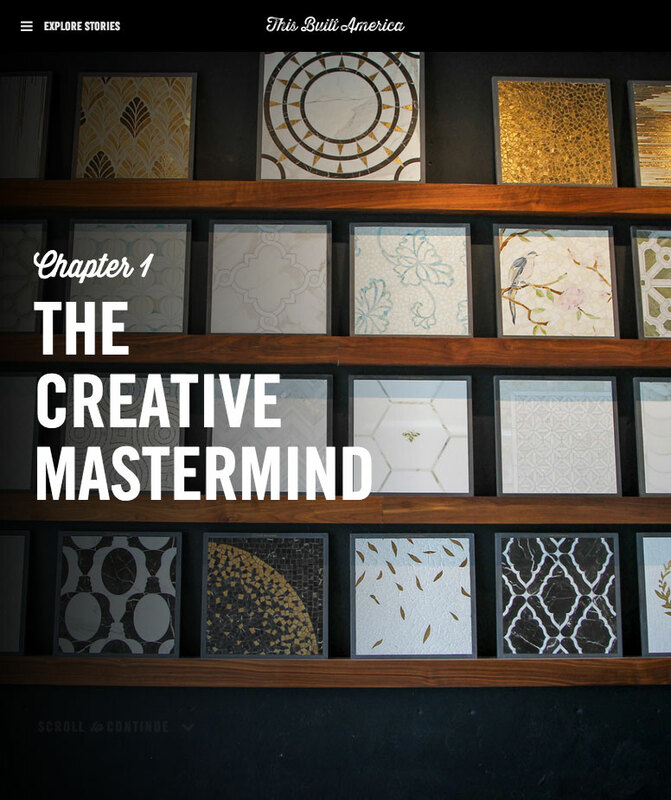 Writing for Interior Design magazine, Josephine Minutillo, reports, “Over the last two decades, Baldwin has turned her thriving mosaics business into a catalyst for change in Exmore, transforming once abandoned buildings into hubs of creative activity and bringing nearly 120 much-needed jobs to the local community. Baldwin’s success story started in an unlikely place—her parents’ living room. After teaching art in New Orleans, she returned home in 1992 to be closer to family and pursue her passion for creating beautiful surfaces out of tiny pieces of glass and stone, naming her new company after the Italian city renown for its ancient mosaics.” There is much more in the article if you’d like to read more of this heartfelt story.